On May 31, 2017, I traveled to Shreveport, Louisiana to see the Confederate Monument located at the Caddo Parish Courthouse and to meet with Paul Gramling about the monument’s future. Ronnie Dancer, who operates a Facebook page called “The Who’s Who of Miller County Elected Officials” is a friend of mine from Miller County, Arkansas. Ronnie and I had started talking about the recent issues and monument removals from New Orleans. During our conversations, Ronnie asked if the Four States News would like to interview some of the people involved in defending the monuments. Naturally, I was interested in talking with them. I know that Ronnie is a member of the Sons of Confederate Veterans (SCV) and is a Lieutenant in the organization’s “Mechanized Cavalry” division, a motorcycle branch of the SCV. 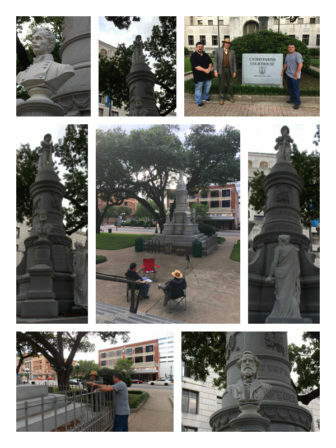 Ronnie was quickly able to arrange a meeting at the monument currently being reviewed in Shreveport, Louisiana. Prior to meeting Mr. Gramling, all I knew about him was that he was a member of the SCV, the Lt. Commander-in-Chief of the SCV, and a defender of keeping the monuments in their current and original locations. We arrived, found parking and as we unloaded the car, I noticed a man who seemed out of place sitting on a park bench in front of the courthouse. Around him were tourist, homeless people, and a few police officers walking the area. Despite the variety of people, Gramling stood out for his unique dress and appearance. He had the appearance of a college professor who should be buried behind research books in some dusty, college office researching and studying history. As we grew closer and made introductions, I noticed the symbols on his label and the insignia on him that clearly said, “Lt. Commander-in-Chief”. Through our brief talks before we sat down, I learned that Mr. Gramling is not only a defender of the monuments and a member of the SCV, but he is the current number two person of the SCV in the United States. As we had small talk it was also apparent that Mr. Gramling was by no means an uneducated man. He knew history as he explained many aspects about the courthouse, its history, and even the history of the grounds surrounding the courthouse. He spoke with a soft, authoritative voice that a professor might use in a college class and I began to suspect that by the end of the interview, he might just take out a pop quiz to see how much I was paying attention. We found a place just behind the monument and close to the steps of the courthouse to sit down and talk. What started out as a simple conversation with some basic questions quickly turned into an hour and a half discussion. There is simply no way I can put all the information that Mr. Gramling supplied into this article; however, I want to tell the reader what he had to say, what I saw, and what we should all know about the SCV, the United Daughters of the Confederacy (UDC), and the various monuments erected by those organizations between the 1890s and the early 1900s. It’s fascinating, it’s part of all of our history, and whether you agree with the history or not, it’s important that we know all sides in this battle over monuments that is currently being debated and discussed around the country. 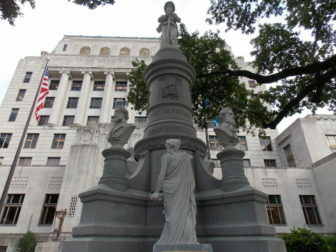 This monument to Confederate Veterans and those who died in the war is located at the Caddo Parish Courthouse. The monument was built in 1905 by the United Daughters of the Confederacy, and placed on the National Historical Register by the Louisiana Department of Culture Recreation and Tourism. As anyone can tell you, the monument has many meanings to different people. Despite those different meanings that people feel and express, the purpose is clearly stated and documented in the United National Historical Register’s 52-page application and on the monument, itself. The monument states that it was “Erected by the United Daughters of the Confederacy. 1905, Love’s Tribute to Our Gallant Dead.” The left hand of Clio, who is considered the Muse of “History,” points to the word “Love”. Her right hand is down and holds a scroll that before 2010 had the word “History” on it. Paperwork and the monument indicate that it was erected to honor those who died fighting in the Civil War. Interestingly, the paperwork states that the monument is both “Public” and “Private” in its ownership, which is a question that the press has raised in regard to early records from around 1900 indicating the land may have been given to the United Daughters of the Confederacy specifically for the monument. When presented with this information, Mr. Gramling pointed out that the police jury in 1903 had given the land to the United Daughters of the Confederacy(UDC) as indicated in their notes from that meeting. In addition, they had provided $1000 toward the building of the monument. Apparently, due to ownership records, still in question at this time, there was no deed transferred to the UDC; however, the police jury notes do indicate an intention to give the land to the UDC by a unanimous vote for the purpose of building the monument. The Caddo Parish Monument, much like other monuments of the time period, were being built around the country to honor the fallen soldiers from the Civil War. Mr. Gramling pointed out that many of these soldiers died on battlefields and were often buried in mass graves, or in graves far away from their homes. These monuments were a way of continued healing, a way to honor the fallen, and a way for the relatives and decedents to have a place to visit and honor their deceased loved ones and family members. According to records, this period of time was often called the “Cult of the Confederacy”. It was a monument building period where many small and large towns across the south celebrated and honored the men who had fought for the south during the war. There were parades, celebrations, and like the 1906 dedication of the Caddo Parish Monument, there were dedication days for the various monuments. When I pointed out that many people consider these monuments to be to people who are traitors to the United States, Mr. Gramling countered with to two facts. He said that first “we cannot apply today’s standards or moral guidelines to those of the 1860’s.” He pointed out that at that time “loyalty to your home state was more important than loyalty to the government of the United States.” These men, many in U.S. service at the time, waited for their home states to vote and if secession was approved, then they went home to defend or serve their home states. Secession was seen as a right by many states even to the point that Congress introduced the Corwin Amendment which would have allowed each state to continue or discontinue slavery and other practices without any further interference from the United States. Mr. Gramling explained that the Corwin Amendment was designed in hopes of keeping states from leaving the Union and in hopes of getting those that might leave to return. Historical records indicate that, just as Mr. Gramling stated, this amendment was meant to encourage states to remain in the Union by basically offering to ensure self-governance without federal inference. He also pointed out that in 1958, Congress made all those who fought in the Civil War, regardless of which side they fought, American Veterans. Mr. Gramling was referring to the act by Congress, almost 100 years after the war started, that seemed to be another form of forgiveness and healing. However, from what the Four States News has been able to find, the more important implications of the act by Congress is that it now means that all Confederate Monuments erected during the period known as “Cult of the Confederacy” are now considered monuments to American War Veterans. Taking them down appears to be no different than taking down a World War II monument, Korean War Monument, Vietnam Monument or any other monument dedicated to those who died in wars as Americans. At this point, I pulled out a photograph that I had copied off of a Facebook site. The photograph featured several SCV members and their wives. There was at least three African-American people in the photograph. One wore a jacket with a Confederate Flag on the front. I was informed that the man was a member of the Mechanized Calvary and a SCV. I was told that the woman, well-known for speaking in support of the monuments, was an African-American descendent of a Confederate Veteran. I had heard the lady speak on a video recently at the Confederate monument in Caddo Parish. She had been passionate and articulate in her defense and she had stressed that they should not use her “color” as a reason to remove the monuments. As I put away the picture, I looked at Mr. Gramling and said, “The mainstream media doesn’t seem to want to show African-American’s defending these monuments. They simply keep using the term ‘White Supremacist’ in regards to them.” Mr. Gramling just nodded and said, “That part of the story doesn’t fit into their agenda.” He further noted that during the last hearing for the Caddo Parish Monument over 70 people had spoken in favor of keeping the monument at its current location. Four had spoken in favor of moving the monument. Mr. Gramling said that when the news coverage aired, they showed three people wanting the monument removed and one supporting that it should stay. Mr. Gramling pointed out one historical fact that is not making the news waves. The location of the monument in Caddo Parish is the last place where the Confederate Flag- the national flag of the Confederacy – flew. He said it was last taken down from the site of the current monument on May 26, 1865. This alone makes the site a historical landmark for the entire country. For those who want to remember and cherish his or her heritage, the site is the last location of official Confederate Government. For anyone wanting to remember the end of the war, it is also important as a symbol of the Union’s final victory in the war and the removal of the Confederate Government. It would seem that whether a person supported the Union or the Confederacy, they should have some significant ties to the location of the Caddo Parish monument. This was my first visit to the Caddo Parish monument. While there I spent a lot of time looking at the monument and reading what was on it. I saw the word “Love,” and I know that “History” was once a part of the monument’s message. I also saw the words “Lest We Forget”. From all indications the Daughters and the Sons of the Confederate Veterans are loyal Americans, their memberships include Caucasians, African-Americans, and many others. Members like Ronnie Dancer have been in law enforcement and work for our counties, and Mr. Gramling retired from the United States Post Office. They work not to honor the memory of slavery, but of the Confederacy and those who fought and died defending their homes. From my study and talk with Mr. Gramling, I learned that many, men like General Lee, freed the slaves his wife owned when they were married before the war, others never owned slaves. The Confederate President himself adopted a homeless orphan who happened to be African-American raised him, taught him and helped him gain an education. These histories are often overshadowed by the fact that the war eventually focused almost completely on slavery by the end. The monuments were put up at a time to honor men who, in many cases were almost too old to attend the ceremonies and to honor those dead who never saw the end of the war. In many cases those dead never had a proper burial and still have no grave markers to this day. The only marker or stone to remember them by will often be these monuments throughout the south. From everything we can see, this monument is a part of Caddo Parish history, African-American and Caucasian history, but even if it was simply a part of one race’s history, it was not put up in the name of white supremacy, but instead in the name of healing and reconciliation from a war that tore the United States apart and affected so many families both Union and Confederate. These monuments are well over one hundred years old now. They have stood through storms of political diversity and nature. They have, just by their being, become a part of southern and indeed national history. Monuments like this one and the ones in New Orleans played a large role in the healing process for our nation between the late 1890s and the early 1900s and that alone makes them an important part of the United States and our history. In closing Mr. Gramling expressed a concern. He said, “Those attacking these monuments are attacking all southerners and the spirit of the south. The south has always had a strong and proud spirit that is alive today. They know that if they can crush the southern spirit, then they can crush the spirit of the nation.” Mr. Gramling agreed when I pointed out that not only are Confederate Monuments being attacked, but recently there was a demonstration to remove monuments to Sam Houston in Texas. From everything I gathered through research and discussions with Mr. Gramling, it is apparent that the Daughters and Sons of Confederate Veterans are not a racist group intent on reviving the old south and slavery. In fact they are both benevolent groups intent on sharing history, preserving history, and helping advance education and study for anyone interested. They recognize there is good and bad history about the Confederacy, just as there is good and bad history about the United States. The monuments they erected over one hundred years ago were for healing, remembrance, and honor. They were never meant to be used by racist groups, and they condemn those groups who try to use them just as they condemn them for using a Confederate battle flag or the United States flag for their evil propaganda. Hopefully, the end result will not be a removal and hiding away of this nation’s important past with the Civil War. In our opinion, if those who wish to remove southern history are allowed to do so, then it will not be long before they attack the history of other groups and attempt to remove statues and monuments dealing with everyone’s history. Note: I do not unusually place references at the end of any articles; however, I felt it would be appropriate with this article so that anyone reading this can see the research and source materials for this article. Facebook -Who’s Who of Miller County Elected Officials . (n.d.). Retrieved May 28, 2017, from https://www.facebook.com/search/top/?q=whos who of miller county Facebook Page Maintained by Ronnie Dancer, Sr.
Today, 11-11-18, at 11 a.m. Paris time, the guns went silent. One hundred years ago today in 1918, the world collectively let out a sigh of relief as the killing officially ended. Europe remembered the end of World War I earlier today. It was designated that on the 11th day of the 11th month, at the 11th hour in that cold morning of 1918, the great war would end as swiftly as it had begun. We are seven hours behind the hour that marked the end of the war one hundred years ago today. For Americans living in the four states area, World War I would have ended on November 11, 1918, at 4:00 a.m. in the morning. It started with a suggestion in June, followed by a meeting on July 2, and finally a formal signing on July 4, 1776. From that moment on, the cry would go up around the world that the colonies of the North American Continent, all thirteen of them, had declared independence from Great Britain. Like any country, Britain would not take kindly to losing the colonies. In fact, no country in the history of the world has ever simply said, “Sure, go ahead and leave us and take all the investments we made into your area with you.” No, instead the greatest empire in the world set out to reclaim the colonies and force them back into the British realm. The rest of the story, you know as the United States won independence in the war that followed. To this day, we still hear our friends across the pond in England wish us a “Happy Traitor’s Day.” Naturally, this is done more in good humor now that we are friends so many years after the revolution. The founding fathers were by no means blind to the fact that they were setting in motion something that would be celebrated for years, and perhaps forever. John Adams wrote to his wife of the importance of the entire event that officially started on July 2 and ended on July 4. He sent his letter on July 3, 1776 that included the following statement: "The second day of July 1776, will be the most memorable epoch in the history of America. 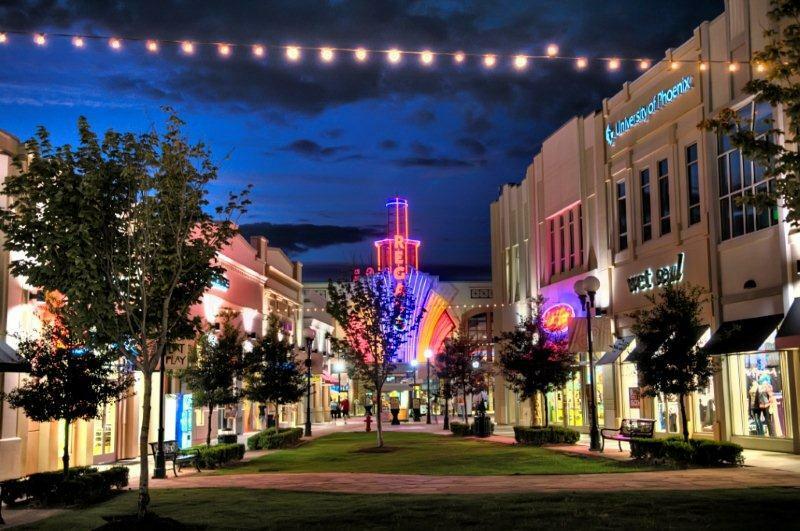 LITTLE ROCK – The Military Retirement Income Tax Cut, which Governor Asa Hutchinson signed into law in February, will go into effect January 1, 2018. The tax cut, which eliminates state income tax on military retirement pay, was one of Governor Hutchinson’s priorities for the 2017 legislative session. Sci-Port and Dragons: Genoa Elementary Third Graders On The Road! Bonus Card proceeds to benefit the American Cancer Society 'Making Strides Against Breast Cancer' Walk during October’s National Breast Cancer Awareness Month.